We learned about Ford’s plans to begin building the 2017 Escape with R-1234yf refrigerant during a meeting with their regional parts and service manager at the Philadelphia Auto Show back in January, and we finally had a chance to check out one of these newest MPVs (Multipurpose Passenger Vehicle) this week at Lansdale’s Yocum Ford. Ford redesigned the Escape for the 2017 model year, incorporating their newest R-1234yf A/C system. 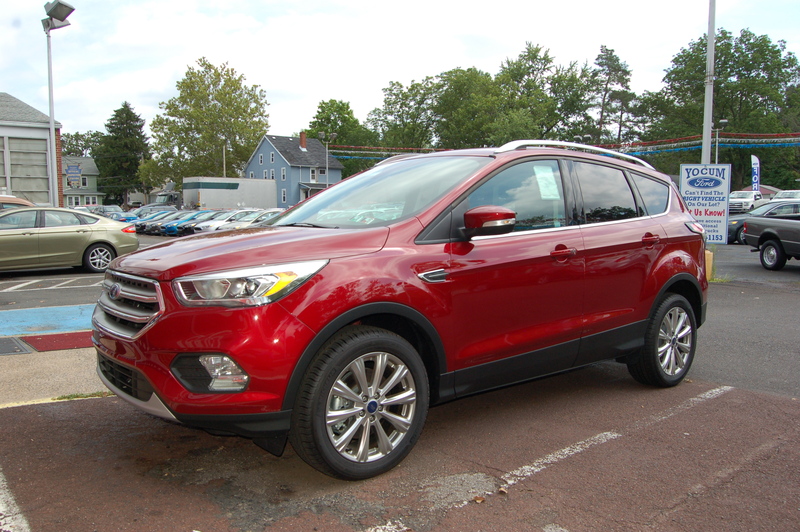 Ford is offering three different engine choices for the 2017 Escape: The 2.5L with independent variable cam timing (iVCT), the 1.5L EcoBoost® iVCT, or the 2.0L EcoBoost® with twin-scroll turbocharger. But either way, each one is charged with 1.50 pounds (or 24 ounces) of R-1234yf refrigerant. It also uses PAG (Polyalkylene Glycol) oil similar to previous models, but take note: it’s not the same PAG oil that Ford used with R-134a! The 2016 Escape (which was charged with R-134a) used their YN-12-D oil (Ford Specification Number WSH-M1C231-B). That’s not the case for 2017, which requires YN-35 oil (Spec # WSS-M2C300-A2) to work with the new refrigerant R-1234yf. Sure, they’re both PAG oils, but they’re composition is different and they should not be mixed or interchanged. 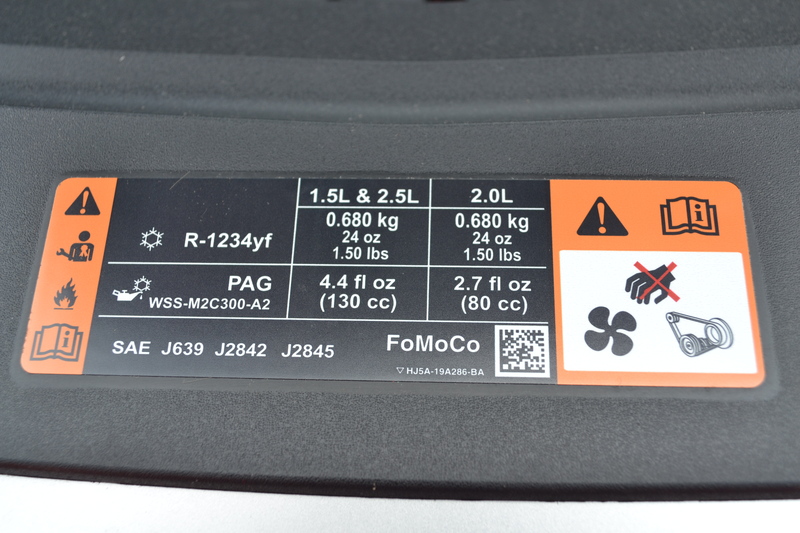 All 2017 Escapes require 24 ounces of refrigerant, but check out the oil amounts. At just 2.7 ounces for models with the 2.0L engine, it’s one of the smallest oil charges we’ve seen! This is Ford’s first US production vehicle being sold with the new refrigerant as the company prepares to meet upcoming EPA rules set to take effect as early as 2019, when the very first 2021 model year vehicles will start being seen. 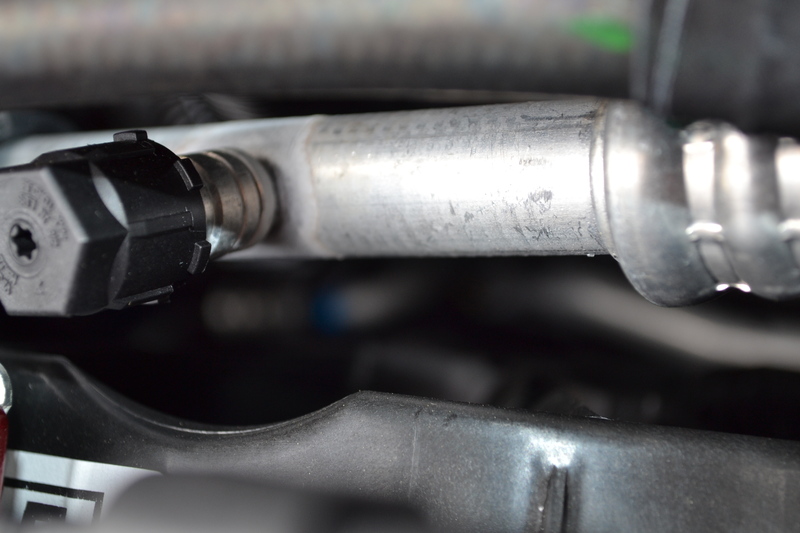 Finalized in July 2015, these new regulations make R-134a unacceptable for use in passenger car and light truck vehicle production beginning with the 2021 model year, which is why R-1234yf adoption is speeding up. 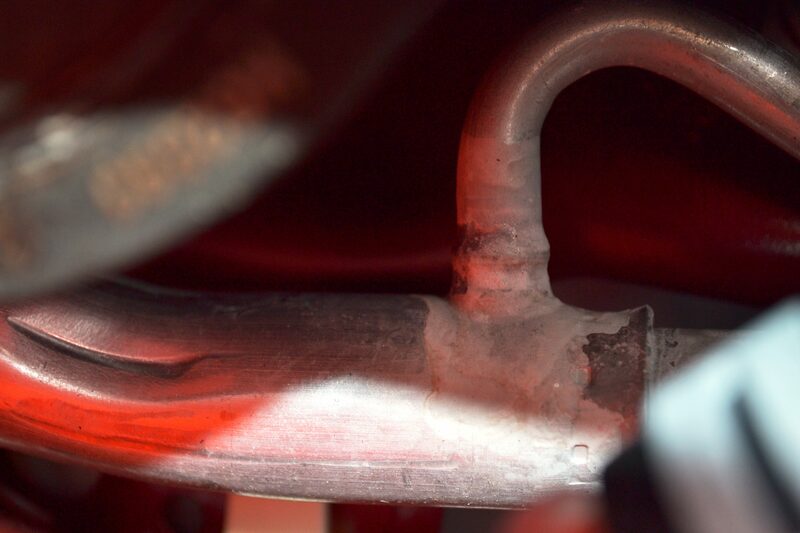 Similar to other vehicles already using the gas, Escape includes a rather long inline heat exchanger (IHX) which acts to improve system efficiency. Here we can see the high-side line connected to the IHX, which surrounds the low-side suction line. It helps to subcool some of that liquid even more before it reaches the Thermal Expansion Valve (TXV) and eventually, the evaporator. Escape is available in three trim levels: S, SE and Titanium. A/C is standard on each, but if you want dual-zone automatic climate control, you’ll have to go with SE or Titanium (our test model). S comes standard with a manual, single zone A/C system with no option to upgrade. Pop Quiz! 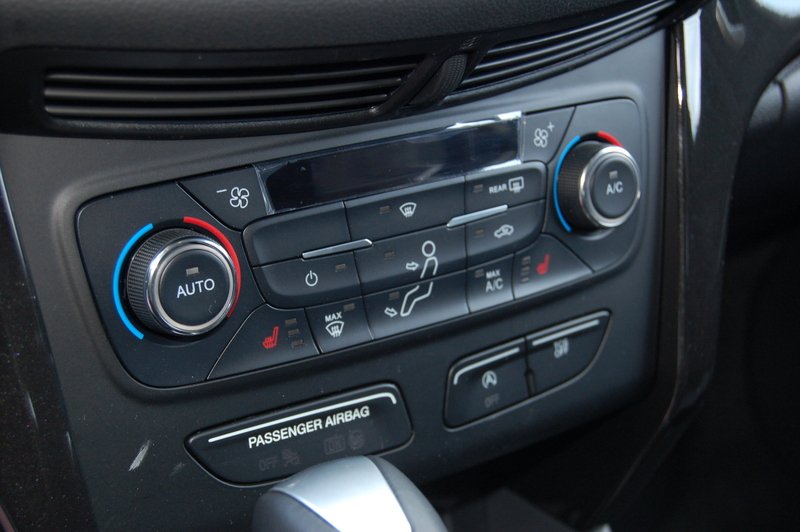 Can you tell which A/C line is pictured here? And one more: What’s missing from this picture? Study the picture carefully yourself, then scroll down to find the answers! Stay up-to-date on all things A/C, including the latest developments with R-1234yf refrigerant, rules and regulations at MACS website www.macsw.org and clicking on News. Answer to Caption 5: If you said suction line (or low-side line / service port), then you’re right! But can you tell what’s missing from this picture? Look closely at the cap: those nubs are a sure sign that this is a tether cap, designed to work with a small strap (also known as a tether) to keep the cap securely attached to the service port, even when it’s unscrewed from the port. This one’s missing; otherwise we’d see a ring around the cap connected to the attaching strap. The service port cap is considered to be the primary seal of the service port, and the idea behind a tether is that it will help us all to not lose those caps and act as a reminder to put them back on! After all, refrigerant leakage is the number one cause of A/C system performance issues, which is why we should do all we can to repair and even help prevent leaks from happening in the first place. This entry was posted in #1234yf, Automotive training, MACS Member, Mobile Air Conditioning, Refrigerants, Training and tagged #air conditioning, #CARSWR1234yf, #MACS Member, #Macs worldwide, #MACSW, #Mobile Air Conditioning Society, #R-1234yf, car repair, professional service, recovery recycling machine, refrigerant. Bookmark the permalink.